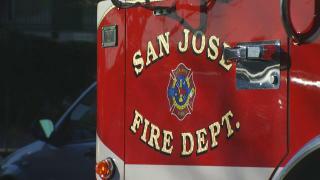 After initial reports that no one was displaced by an extinguished two-alarm residential structure fire in San Jose Wednesday afternoon, fire officials are now reporting that a family is receiving shelter aid from the American Red Cross. Four adults and a child will be housed for at least one night due to the damage to the building's attic, Fire Capt. Daniel Vega said. Firefighters were called at 1:20 p.m. with reports of flames in the 2700 block of Gavilan Drive, according to Vega. Four minutes later, crews were on scene spraying the fire down. The first crews arrived to find that the fire, the cause of which is yet to be determined, started in a shed on the property and moved to the nearby home's attic. Due to a language barrier or similar form of miscommunication, first reports indicated that someone was trapped inside the attic, Vega said. This fortunately proved not to be the case. By 1:38 p.m. the fire was knocked down and by 1:51 p.m. it was under control, Vega said.